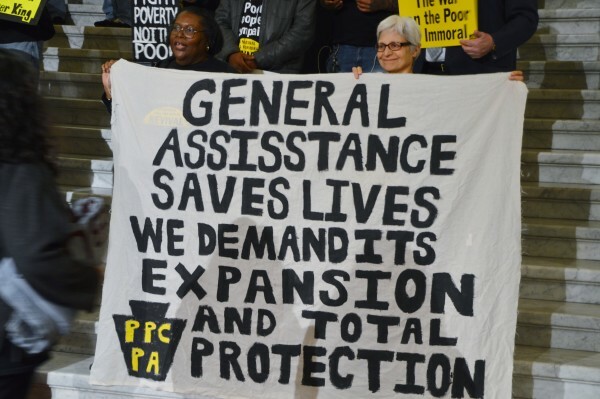 STOP ELIMINATION OF GENERAL ASSISTANCE! The bill that would end General Assistance — HB 33 — was passed by the PA House Health Committee on Monday, March 25 and may move quickly to the House floor for a vote. Please contact your local legislators and tell them vote no on eliminating or cutting GA. Call and email your local PA House member, other legislators – also your local PA Senator. Call their Harrisburg and local offices. Please see sample script, below. Testimony from Every Mother is a Working Mother Network and Global Women’s Strike/Philadelphia that was read as part of the PA Poor People’s Campaign Demands Delivery event in Harrisburg last Tuesday, March 19. Also, oppose Governor Wolf’s proposal to divert GA funding to affordable housing – we need both cash assistance and housing! I understand that HB 33 that would once again eliminate General Assistance, finally reinstated in 2018 after it was gutted in 2012, has passed the House Health Committee and is heading for the House floor. We are counting on you to fight to keep GA, which is a lifeline for those in need who are ineligible for other forms of cash assistance including Temporary Assistance for Needy Families or TANF. People of color would be disproportionately impacted. Can we count on you to vote against HB 33 and to put pressure on your fellow legislators, Democrats and Republicans, to not only save GA but increase the benefits and expand this vital program? And to oppose Governor Wolf’s proposal to divert GA funding to affordable housing? We need both cash assistance and housing!